GAGNE TA RENCONTRE EXCLUSIVE AVEC BOOBA!!! SI TU ACHETE TA PLACE SUR LE SITE WWW.MILIT-ART.FR TU POURRAS ETRE TIRE AU SORT ET GAGNE TA RENCONTRE AVEC BOOBA!!! DE PLUS PROFITE D'UN TARIF REDUIT POUR TA PLACE DE CONCERT! 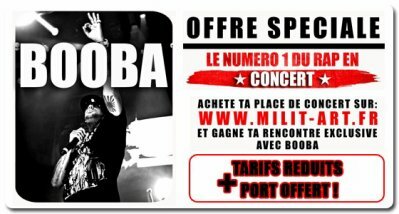 OFFRE SPECIALE: SI TU ACHETE TA PLACE SUR LE SITE WWW.MILIT-ART.FR TU POURRAS ETRE TIRE AU SORT ET GAGNE TA RENCONTRE AVEC BOOBA !!! DE PLUS PROFITE D'UN TARIF REDUIT POUR TA PLACE DE CONCERT!